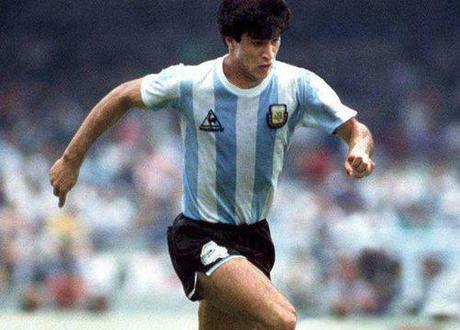 If you think about a meteoric landing in the Italian league, one can not mention Daniel Claudio Borghi, an Argentine midfielder born in 1964 and nicknamed “El Bichi”. A Rising star of world football in the first half of the ’80s, he impressed for his excellent and elegant technique, while wearing the jersey of Argentinos Juniors. This was soon realized by the coach of Argentina, Carlos Bilardo, who called him for the World Cup in Mexico. Argentina became the world champion, but Borghi played very little and badly, and he never made it back into the selection. Only one year before, he played what was undoubtedly the best game of his career: Juventus-Argentinos Juniors in Tokyo for the final of the Intercontinental Cup. Platini’s Juventus won on penalties, but people were impressed by his crystalline class. Michel Platini said the same after the game: ‘Borghi is the Picasso of football’. Borghi’s biggest fan was the A.C. Milan president Silvio Berlusconi, who literally fell in love with him and offered him a contract in 1987. He played throughout the preseason with highlights of great class and a few goals (one to Real Madrid). He also became the first architect of the rabona, a difficult technical gesture that today we often see, but, at the time, was practically Borghi’s own invention (in addition to crosses and assists, he even kicked corners that way). Unfortunately for him, in those years in Italy clubs were not allowed to register more than two foreign players, and having already the Dutch Ruud Gullit and Marco Van Basten in the roster, Milan loaned him to Como, where under the guidance first of Burgnich and then Agroppi, he collected only seven disappointing starts. He appeared sad and bewildered, overpowered by homesickness. A legend was born of the ‘pupil of Berluconi’ (his approximate pronunciation for Berlusconi), who, apparently, often phoned him at home to offer support. Despite the bad season, the following year he was brought back to Milan where, again, he played all the pre-season. He scored a fantastic double-goal in a friendly against Manchester United, but, even with the changing of the rules on foreigners, increased from two to three, he was not able to gain confirmation. What happened then? The incident occurred probably gave birth to Sacchi’s Milan. Against Berlusconi’s will, the coach of Fusignano wanted to sign a young Dutch, a midfielder of Real Zaragoza unknown to most people: Frank Rijkaard. The debate ‘Borghi or Rijkaard’ lasted for weeks, with the president sponsoring the Argentine on a number of occasions, and with the coach determined to request the third oranje. The confrontation was won by Sacchi, despite the presidential jabs, so Rijkaard became one of the best midfielders in the world and contributed to many victories. Borghi was sold in Switzerland to Neuchatel Xamax where he played in a single season with many more shadows than lights, before returning to South America to play in different leagues in Argentina, Brazil and Chile (he closed his career with the Santiago Wanderers at the age of 34). The original Italian version of this entry is available here.